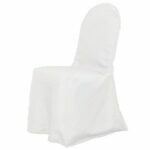 To achieve the ultimate finished look, take a look at our chair covers. We have 5 different styles to choose from. Our basic colors are White & Ivory, but any color is attainable.